I'm deliciously excited that one of my favourite restaurants, Luckee is participating in Summerlicious for the first time this year! This is Susur Lee's third restaurant in Toronto and as expected, the food and service is at the top of his game. Appetizer // I love anything and everything that has watermelon so the first course was an easy choice. A savoury Tofu Salad piled with juicy watermelon and cucumber chunks, mint and drizzled with spicy soya vinaigrette. Main course // Everything sounded mouth-watering but I ended up having the Spicy Szechuan Steamed Sea Bass which was served on a bed of baby bak choy sauteed in soya broth and topped with bean crumbs - never tried these before and they were so good! This dish is light and the simple recipe really preserved the delicate flavor of the fish. If you like heat, go for the Vegetarian Fried Rice. An authentic Hunan spicy dish loaded with crunchy wok fried lotus roots and Chinese celery. Beware of biting into the red hot chilli peppers! Dessert // Good thing this is a trio because it would have been a tough decision between the Passion Fruit and Mango Panna Cotta + Chocolate Sponge Roll + Raspberry Sorbet. After sampling all three I'm slightly biased towards the sorbet - a tangy refreshing end to a wonderful meal. Drink // Wines, beers and specialty cocktails they have it all. This is The Dragon's Roar shaken with tequila, basil, chilli and ginger beer. Cheers! 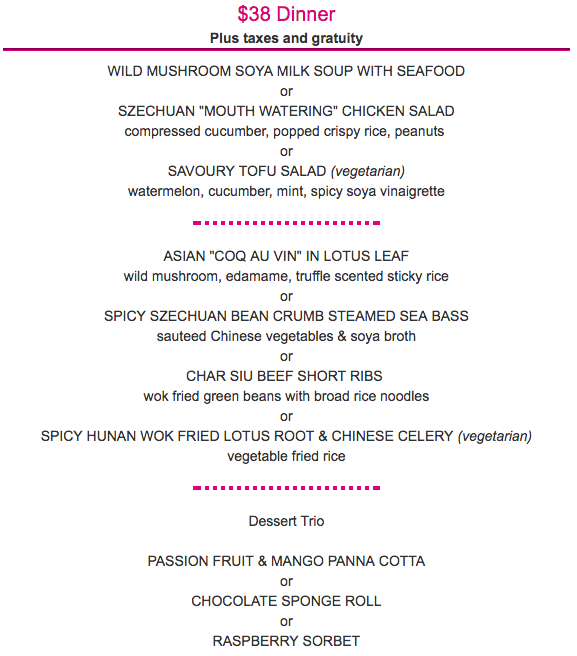 Summerlicious runs from July 8-24 so make sure you reserve a table at Luckee located downtown at 328 Wellington St West in the SoHo Metropolitan Hotel.